We all have played some games in our childhood, as the increasing number of smart phones in the market we are surrounded by handheld mobile to play some interesting games. When i used to play games my parents used to say that i will spoil my eye sight and i will not be doing well in my schools, so they used to give me only specific hours to play i guess same happens still now. Well all these have been proven different in the recent years. 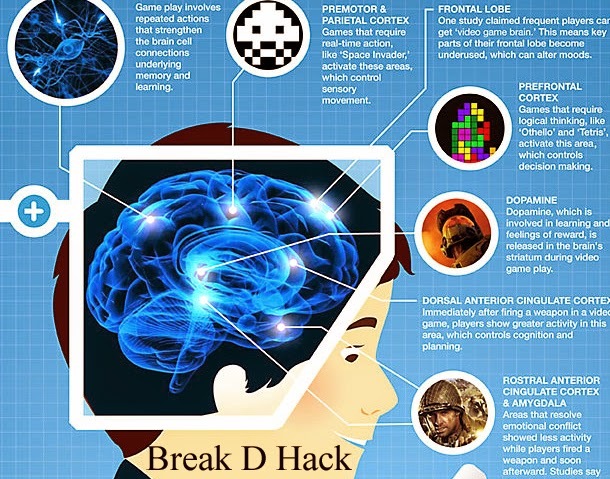 A few months back a group of scientists found out with an experiment that playing video games would increase your creativity hugely and now there is an another break through, it has been found out that that gaming can help you thicken your brain. The study with a group of adolescents showed that they had a increase in thickness in two parts of their brain, the left dorsolateral prefrontal cortex and the left frontal eye field. The prefrontal cortex deals with the decision making skills of the brain often referred as most important part of the brain and the frontal eye field are more into processing of the visual information and decision making about it. The two above parts combined does the huge amount of work of the brain, so when this part is thickened we will do a better job. We are not saying that this is because of Gaming alone but there is a strong possibilities. The most interesting thing is that we can play a lot of games from now show this to who ever tells you not to play your video game.